Owner Loes Kok started with a screen printing shop in 1998, which mainly focussed on reproducing art for art sales. Her former company “Untitled” expanded and also started to frame art. After that a digital print shop and art gallery followed. 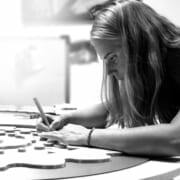 Loes has worked with many well-known artists, like among many more: Herman Brood, Jeroen Buitenman, Marcel Wanders and Robert Whitaker. In 2008 Loes started the company “Bull Creative” with which she went down a new road. Before that everything revolved around art. After that the main focus was placed on ART, DESIGN and PRINTING for OFFICES, SHOPS and HOMES. We work with companies which want to strengthen their identity by visualising that in and around their buildings. For example by completely covering a wall in their on design. Very impressive, especially with big sizes. This can also express itself in visuals printed on glass, acrylate, aluminium, wood, etcetera. The possibilities are endless! Are you curious what this would look like? Be sure to take a look at our portfolio on this website or Instagram! We make customised designs, based on the wishes of the customer and the identity of their brand. We are strong when it comes to concepts, love to think along, offer excellent service and work exclusively with materials of the highest quality. Besides that Bull Creative still offers a very large and unique collection of artwork. Plus takes care of the legacy of Herman Brood and produces all reproductions for Jeroen Buitenman. Loes Kok has, with her 20 years of experience, developed a very professional (attire) when it comes to ART, PRINT and DESIGN. She also has wide network of well-known people in her field of work and in the world of art, which inspire her every day. That’s why Bull Creative keeps growing in her knowledge of the craft. That makes her able to provide her customers with the most beautiful designs, materials, applications and service. 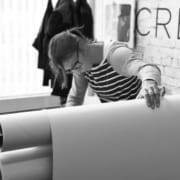 Kirsten Koning started work at Bull Creative in 2016. She has very much experience when it comes to DESIGN in all sorts of branches. Like window dressing, visual merchandising, expo’s, marketing and communication. Because of her knowledge she has a good feeling for styling and has made many strong DESIGNS, from concept to end product. Kirsten also supports the production of prints. 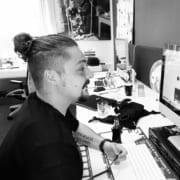 Thomas Lemaire has proudly been supporting Bull Creative by handling the online media since 2018. A profession on it’s own to which Bull wants to give more attention. This means that our followers and customers on social media will get to see more of our projects, work processes, and our team. With these storylines and photos we hope to give an interesting look ‘behind the scenes’. 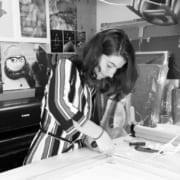 Rosanne Veldhuizen has been strengthening our team as Intern spatial design since September 2018. She is currently in the last year of her studies at Nimeto in Utrecht. Rosanna will support us in our design, production and application processes. That’s why she will often go with us visiting customers. A new face to get to know. We wish her a lot of fun while learning the craft.